Phone security for $3 a month? If you don't want anyone else to see what you're doing on online on your phone, there is something you can do about it. 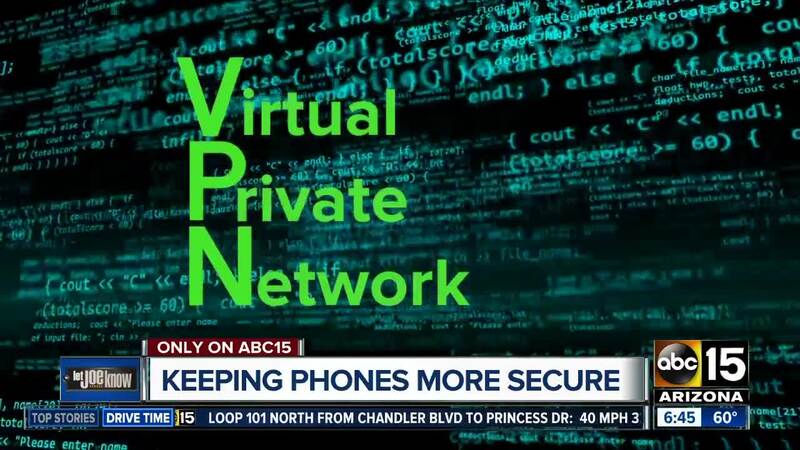 You can use a VPN, a Virtual Private Network. It's software that can be used on phones, tablets or anything where you connect to the internet. Data Doctor's Ken Colburn says VPN's wrap info into a secure package so that only you and the recipient can see it. That keeps it private from casual thieves to data collectors and even advertisers who may be trying to track you. PCMag.com says most of us don't use a VPN. But they say it's necessary if you use a wifi network you don't control. And Colburn says there can be another benefit if you travel out of the country. Netflix and some other paid services may block content if you're not here. But, VPN's can connect to servers around the world. In other words, you can pretend you're still in the United States and possibly get all of the content you would here. We found VPN's costing between $3 and $9 a month. There are free versions, though some experts say they may be limited. Click here to see PCMag.com's comparison of VPN's and prices.